My handsome guy sporting new clothes. And so it has begun … the last year that Zack will attend public school. After this year, then what? It feels like we are slowly walking to the end of a gangplank with the final step looming on the horizon. 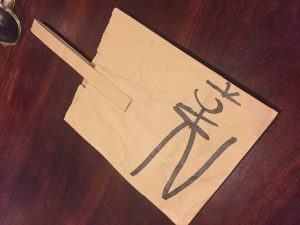 After a summer of ABA Zack is able to print his name on his lunch sack without me holding his hand to help him make the letters. As has happened before, there may be something so much better ahead than I can imagine. I hope and pray so. In the meantime, ABA therapy has ended. Zack’s work assignment at Goodwill starts on Monday–1.5 to 2 hours a day during school when he and a few other students are supervised by a job coach. 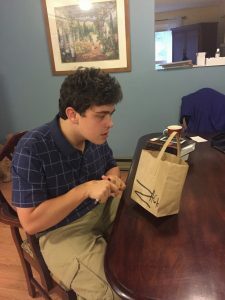 This year, an observer connected with DVR (Division of Vocational Rehabilitation) will be there through February, noting the skills Zack has for possible future job placement. In February, it’s my understanding that the person assigned to us starts trying to place him in an actual job that he will have after school ends. Other parents who have gone before us tell me that most kids work about eight hours a week once they have finished school. What do they do the rest of the time? That’s the dark void I try not to think about. Nicely done! This is the clearest Zack has ever written. I know I’m sounding a bit melodramatic about this … but it is HUGE. The school system is an enormous safety net for people with children on the autism spectrum or with other disabilities. It is a safe place for our kids to be for seven or eight hours a day. It makes working possible for us. It keeps our sanity intact. So now you know how to pray for Jay and me … and Zack … and all the other families who have children with special needs … this year. Previous post Pacific Beach Family Vacation Next post Happy 21st Birthday Zack! I don’t know of sheltered workshops here — they have eliminated them for the most part so there is more integration into the community. Hugs to you too! And blessings on the potty training — it can be done!